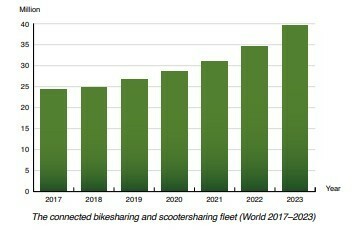 According to a new market research report from IoT analyst firm Berg Insight, the number of deployed vehicles in bikesharing schemes worldwide is forecasted to grow from 24.4 million in 2017 to reach 36.9 million in 2023. Bikesharing is a decentralised bicycle rental service, usually focusing on short term rentals that supplements other modes of transport including walking and public transport. Traditionally, most bikesharing operators have used station-based networks operated through public-private partnerships. This operational model requires members to pick up and return the vehicle at any designated station within a city. Another model that is rapidly gaining in popularity is free floating services, which enables members to pick up and drop off vehicles anywhere within a designated area. Today, free floating bikesharing has become the most common bikesharing service in terms of deployed vehicles. In 2017, free floating bikesharing companies deployed more than 20 million vehicles in China. This led to an oversupply of bikes and issues with vandalism. Reports suggest that as much as 50 percent of the deployed fleet in some Chinese cities has been scrapped. The average lifetime of a shared bike from several free floating operators is in addition low. Electric bikes are increasingly common and bikesharing companies are developing more robust vehicles. 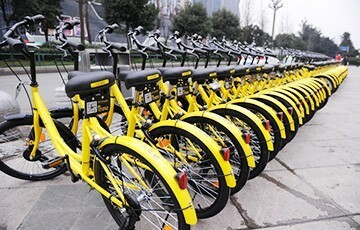 Leading free floating companies such as Ofo and Mobike have recently scaled down their operations in overseas markets and many operators are facing regulatory hurdles that limit the allowed number of bikes in cities. Prominent vendors of bikesharing services and technology also include Hellobike, Lime, JUMP (acquired by Uber in April 2018), Motivate (acquired by Lyft in July 2018), JCDecaux, PBSC, Nextbike and CycleHop. “Station-based and free floating bikesharing constitute parts of a multimodal sharing economy that will have an important role to play in future cities”, concluded Mr. Svegander.